Whether you're sitting down to a rack of our meat-fallin'-off-the-bone Signature Baby Back Ribs, or settlin' in to tackle a slab of our special-recipe spare ribs, you'll find that Woody's couldn't be any further from the big-chain restaurants. 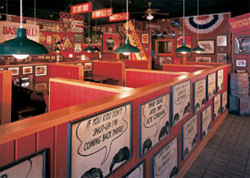 Every Woody's is special with its own hometown atmosphere and every Woody's serves up only the best. We use the finest cuts of pork and beef and the freshest vegetables. And everything we serve is a Woody's original, from our secret-recipe Bar-B-Q sauces and freshly-prepared side dishes right down to our famous, moist and tender, slow-smoked Bar-B-Q dinners. 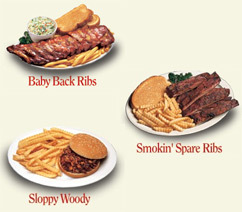 Here at Woody's, we have a passion for Bar-B-Q. And a passion for great franchise partners. With a lower start-up entry cost and outstanding franchisee support, Woody's is a great opportunity within the fast-growing casual dining segment. And, Bar-B-Q is hotter than ever. The training and assistance Woody's Bar-B-Q provides its franchisees covers everything from washing dishes to restaurant management. We'll teach you food purchasing and preparation, the "do's and don'ts" of customer service, and how to hire, train and manage your employees. Franchise Advisory Committees and Regional Marketing Groups are an important part of your growth as a Woody's franchise owner. And that's just what we'll do to help you succeed. Our team will also work with you on your grand opening plans and your marketing and advertising programs to ensure that you have everything you need in the way of menus, table tent cards and in-store promotional materials. We'll provide you with operating and marketing manuals. A Woody's team will be on hand during your initial start-up. After you're in full swing, a Woody's franchise service representative will visit you on a regular basis, and you can call for guidance any time the need arises. Whenever you need assistance, for as long as you are a franchise owner, Woody's will be there to support you. We've worked hard to find the best support tools for our franchise owners. Modern computer reporting and Point of Sale Systems provide real time information. Everything from inventory control, sales and cost breakdown, to staffing is readily at your fingertips. When it comes to how your business is doing you won't have to guess or spend hours with stacks of paper. Most of what you need is a simple "click away". This is not a fad chain that is here today, gone tomorrow. Woody's Bar-B-Q is a restaurant concept that has had a solid track record since 1980. Experienced Support Team - Recipes, operations standards and protocols, marketing and franchisee support have been refined and perfected from years of experience. Lower Start-Up Entry Cost - Woody's restaurant footprints and store units are designed to be easily placed in strip centers or conversions, rather than requiring free-standing out parcel stores. Attractive Sales-to-Investment Return - Partner with Woody's Bar-B-Q and share in the growth with solid returns on a lower overall investment. exciting new opportunity for reward. Streamlined doesn't mean we cut corners . . . we won't!! We will train you in all aspects of operating your franchise business and provide you with dynamic opening advertising assistance and customer generation techniques. Our toll-free support line means you always have someone to talk to. Continued training from Woody's support staff helps you in keeping on top of your business for continued growth. The total cost to open a Woody's Bar-B-Q franchise can be as low as $300,000. In comparison some of our BBQ competitors can cost upwards of $2 million dollars. When you compare Woody's to other franchises you may be looking at it won't be hard to agree that, dollar-for-dollar Woody's outperforms our competitors. Please note this franchise is not accepting inquiries from CA, HI, IL, IN, MD, MI, MN, NY, ND, OR, RI, SD, VA, WA or WI. Interested parties should have at least $50,000 to invest. 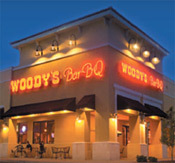 Click on Request Information for FREE info on how to open a Woodys Bar-B-Q franchise today! Please Note: This Woody's Bar-B-Q franchise opportunity and other franchise business opportunities, businesses and franchises for sale on this web site are not to be considered as an "offering", "franchise offering", suggestion or recommendation by Franchise Leader™. This advertisement depends entirely on the truthfulness of the information provided by our advertisers which includes, but is not limited to, franchisers, franchise brokers, franchise consultants and business brokers. Franchise Leader™ recommends that you consult a lawyer, financial consultant, accountant or professional advisor before buying a franchise or business opportunity or any type of business. By using this form or any part of our website, you have agreed to all terms and conditions of Franchise Leader™. Please review our Terms & Conditions for more information.